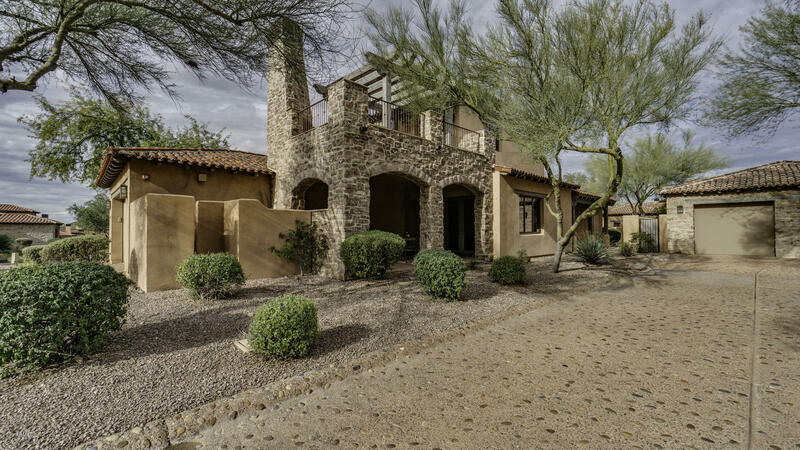 CHARMING TUSCAN HOME OFFERED FURNISHED, (MINUS A FEW ITEMS) IN THE ITALIAN-INSPIRED VILLAGE OF GOLDEN EAGLE IN SUPERSTITION MOUNTAIN GOLF & COUNTRY CLUB IN BEAUTIFUL GOLD CANYON. MOUNTAIN, GOLF COURSE & CLUBHOUSE VIEWS. 3 OUTDOOR COURTYARDS & 2 FIREPLACES TO ENJOY. VIEW OF POND. BIG OPEN GREAT ROOM WITH BEAUTIFUL STONE WALL, GOURMET KITCHEN WITH 5 BURNER GAS COOKTOP, PANTRY & ISLAND. GUEST QTRS WITH PRIVATE VIEW BALCONY WITH FIREPLACE. DOWNSTAIRS MASTER SUITE & BATHROOM WITH JETTED SPA TUB AND LARGE WALK IN SHOWER & DBL SINKS. ++NEW AC, FLOORING & RANAI SYSTEM WITH RE-CIRC PUMP. EXTERIOR RECENTLY PAINTED. SOLID WOOD DOORS, WINDOWS, UPGRADED CUSTOM CABINETS, GRANITE, TILE & WOOD FLOORS THROUGHOUT. WATER SOFTENER, RO, CENTRAL VAC. BRING YOUR CLUBS, JUST A FEW STEPS AWAY TO PRACTICE GREENS!